NEW YORK, New York — Armenia Fund continues to make headway in the construction of a drinking-water network in Sos, a village in Artsakh’s Martuni Region, as well as the refurbishment of the community’s broken water reservoir. The project, launched in October 2009, is co-sponsored by the Hayastan All-Armenian Fund’s French affiliate and the government of Artsakh. “The well being of the Artsakh population is at the center of our humanitarian action, with special emphasis on children-related and water supply projects,” comments Pierre Terzian, Chairman of Armenia Fund, France. The construction of the 7.6-kilometer internal water-distribution network has already been completed. The next and final phase of the project, slated to start in February 2010, is the renovation of the main water reservoir and construction of the smaller distribution reservoirs. Igor Ghahramyan, the Mayor of Sos, said that the residents of the ancient village obtain much of their water supply from a single local well, which is in grave disrepair and contains contaminated water. “Water is the most vital element connecting villagers to the land, and only after solving the water problem can they begin to address other issues facing the community,” Ghahramyan added. 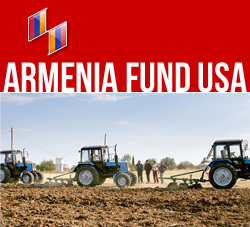 Armenia Fund continues to carry out a number of vital development projects in the Martuni Region. In 2009 it completed water-network projects in the villages of Berdashen and Spitakashen. Currently the fund is implementing school-building initiatives in the communities of Gishi and Chartar, and in the summer of 2009 it completed the construction of a new school in Spitakashen.